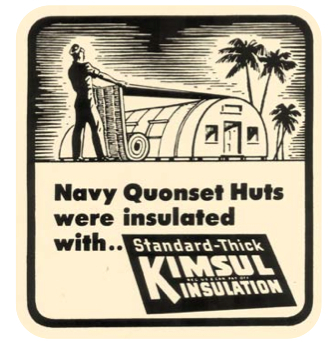 The Quonset Huts continued to be modified at the manufacturing level throughout the production process. The manufacturers were concerned with not only the construction of the huts in the factory and their performance on the field, but also with efficiency of transportation. Crating the T-Rib Quonsets was eventually reduced to one quonset hut contained in three crates, out of an original 12, which, even without the contents considered, decreased the weight immensely. 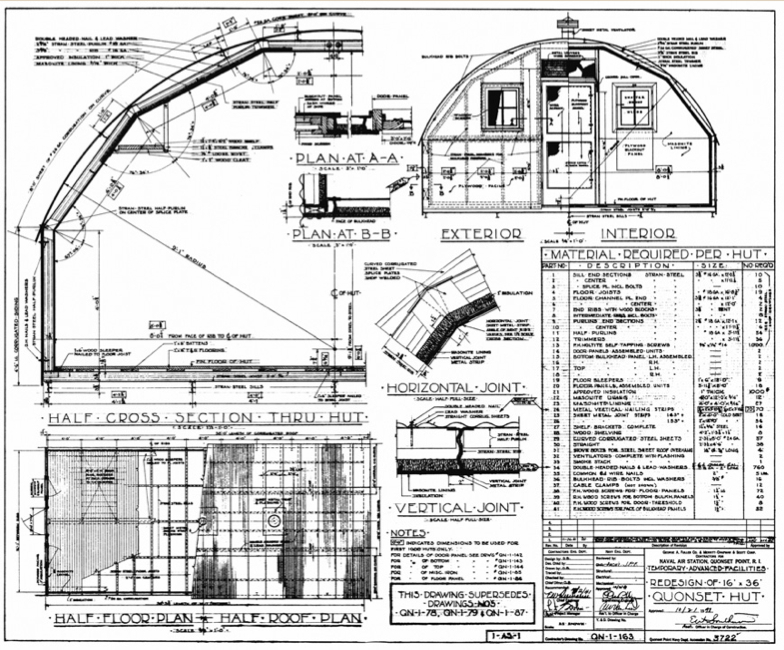 The first major redesign of the Quonset Hut introduced a new steel framing system as well as a new interior shape. 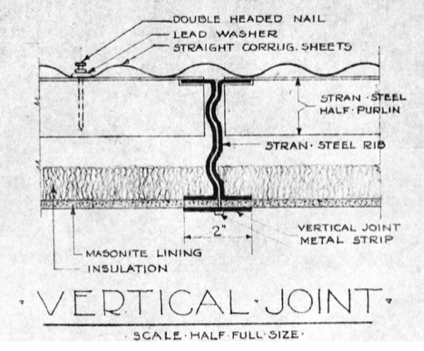 The T-Rib was replaced with the Stran-Steel system of two lightweight steel channels welded back to back, forming an I-shaped member, with a serpentine shaped groove in between. The groove allowed for the use of friction held nails (instead of bolts). Stran-Steel’s framing system outperformed the T-Rib system as it was lighter and faster to erect, without sacrificing the strength or structural integrity. Next, the roof of the Quonset Hut was also redesigned into a segmented arch (rather than a full arch) to maximize usable floorspace, as now equipment up to four feet tall could be placed directly against the walls. 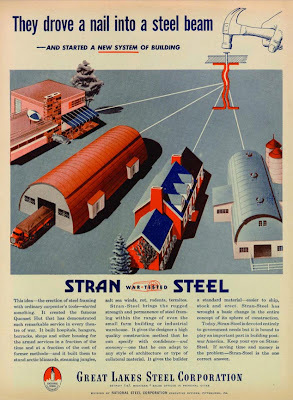 On September 23, 1941, the production of the Quonset Huts was contracted from George A. Fuller and Co. to Stran-Steel Corp. (a subsidiary of the Great Lakes Steel Corp.). 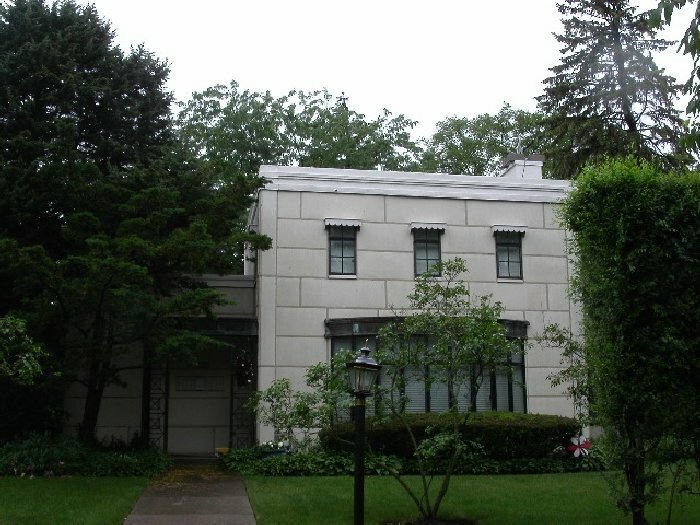 The steel corporation had already established itself in the market of residential light-weight steel framing prior to World War II, with its product making an international debut at the Chicago World Fair in 1933 in Homes of Tomorrow exhibit. The Good Housekeeping Stran-Steel House served as testimony to the strength and versatility of a lightweight steel framing system, which was already being specified for building extensions added to T-Rib Quonsets. The steel company revolutionized the designs again, bringing their previous experience with the hut, and their new steel technologies to the fore-front. The design was approved in October 1941 with Otto Brandenberger remaining the project leader. The new Stran-Steel Quonset reverted back to the full arch, sacrificing floor-space for ease of erection and more compact and lighter shipping. When this Quonset Hut was crated, it required less space than wood-framed canvas tents. 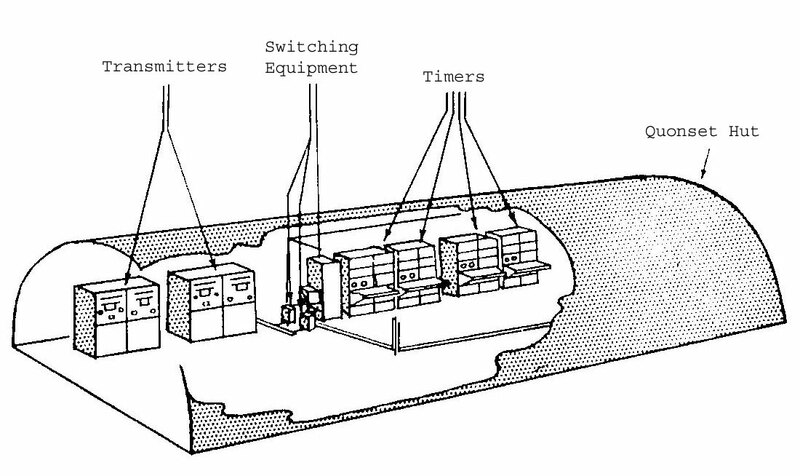 The Stran-Steel Quonset Hut could be put up in one day, by ten men, with only hand tools and no specific skills to construct. 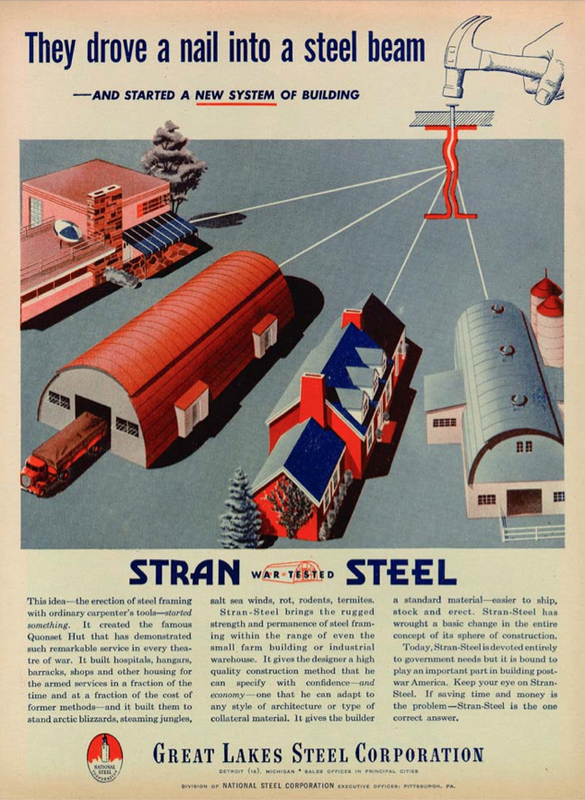 At the end of 1942, Stran-Steel had gained extensive knowledge and experience in constructing and manufacturing the Quonset Huts, and they took over production. This was no surprise as earlier in the year, the corporation had proved that its product was inseparable from the design, and with more experience in mass-production than George A. Fuller and Co., it only made sense to sub-contract production to Stran-Steel. This way, the partnership between George A. Fuller and Co. and Meritt-Chapman and Scott Corp. could focus their efforts on the design, construction and general contracting of supplies for bases. 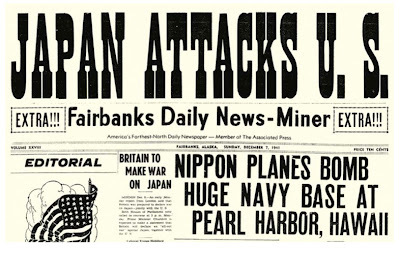 The Navy also benefited in giving up the business involved in manufacturing, because they could shift their energies back to military duties and obtain the huts as they would any other piece of equipment now that the design had reached maturity. In fact, the Quonset Hut was really a collaboration of a number of industries, not only did the US Navy, George A. Fuller and Co., Meritt-Chapman and Scott Corp., and Stran-Steel Corp. work together to design the Quonset Hut, but many more industries were needed when production levels increased dramatically. 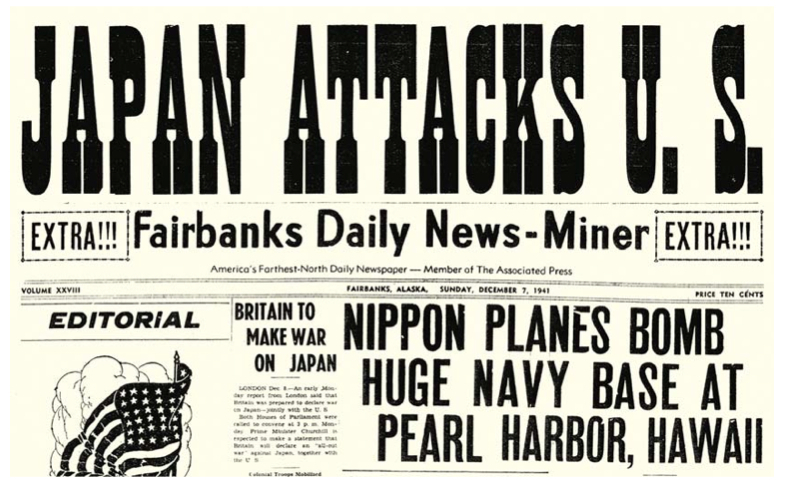 After the attack on Pearl Harbour on December 7, 1941, the navy increased Quonset production from 40 units/day to 150 units/day. The giants of the building industry were soon called into service in the production of different versions of the Quonset, and among these were Carnegie-Illinois Steel Corporation and Bethlehem Steel Company, (supplied steel- arched tees); Masonite Corporation (provided tempered pressed-wood); Kimberly-Clark Corporation (developed Kimsul insulation); and Libby Owen Ford (produced shatter-proof glass for windows). Julie Decker and Chris Chiei, Metal Living for a Modern Age. New York: Princeton Architectural Press, 2005. Julie Decker and Chris Chiei.